Many couples settle for a “good” marriage. Or worse, suffer through a difficult one. But your marriage can be joyful every day and be the catalyst to transform your future. We’re here to help. Don’t settle for average when you can learn how to be EXCEPTIONAL TOGETHER. Since getting married in 1995, we’ve not only constantly worked to strengthen our own marriage, but have helped hundreds of thousands of people around the globe do the same for theirs. Because of our unique experiences in matters of faith and broadcast media, we are certain of a few marital truths: exceptional marriages can beautify the world, good marriages can sustain it and bad marriages can damage it. We are committed to helping married couples build an exceptional life together regardless of their family and bank account size. It’s easier than you think. 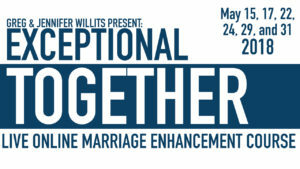 That’s why we’re launching Exceptional Together, a 3-week marriage enhancement webinar course for couples presented LIVE over six different evening sessions. This program is unique and custom designed to meet the needs of registered couples in attendance. Limited to the first 50 couples, this is a one of a kind opportunity to learn how to fortify your exact marriage from the comfort of your own home. No shoes required. We’ll share what matters most from our expertise in faith, marriage, family life and even individual pursuits. Through our professional experiences with keynote speaking around the world, hosting satellite radio, and podcasting on faith, marriage and family life matters, we have already touched the lives of thousands around the world. And now, we’re ready to share it with you so that you don’t have to waste another day feeling unexceptional with the spouse God gave you. It sounds like a tall order, we know! But if you’re willing to work with us and work alongside your spouse over the course of six LIVE interactive online sessions over a three-week period, we’ll teach you how to take the gift of your marriage and turn it into something that can be even more passionate, exciting, and hopeful than on the day you got married. Now that’s what we call a WIN! The only way to fail is to decide to do nothing. You are determined to make your marriage not only work, but thrive and grow in happiness, contentment, and joy. This event starts May 15 and is limited to the first 50 registered couples!